Each of us have that one specific character we can’t wait to be recreated in the Classics line. 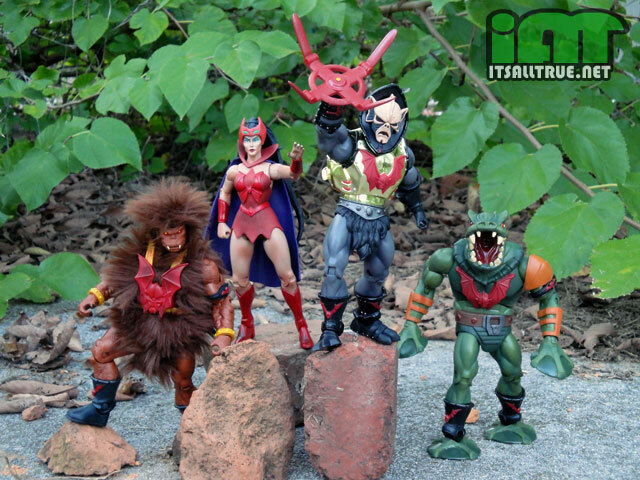 Believe it or not, Hurricane Hordak is the figure I’ve been anxiously anticipating since the very beginning. I just never expected him to be released so soon in the line. My love for Hordak doesn’t come from the Princess of Power cartoon, which I don’t recall ever seeing as a kid. No, my fondness goes all the way back to my eighth birthday when I received a Hurricane Hordak and Mantisaur from my grandparents. It was one of those perfect gifts that I always get a nostalgic feeling about, even so many years later. This was the only Hordak I had as a kid and with his shiny gold armor and spinning weapon hand, he was the only one I needed. Atop his mighty steed, only the combined forces of He-Man and Skeletor could stop this new terror, and the battles were always epic. 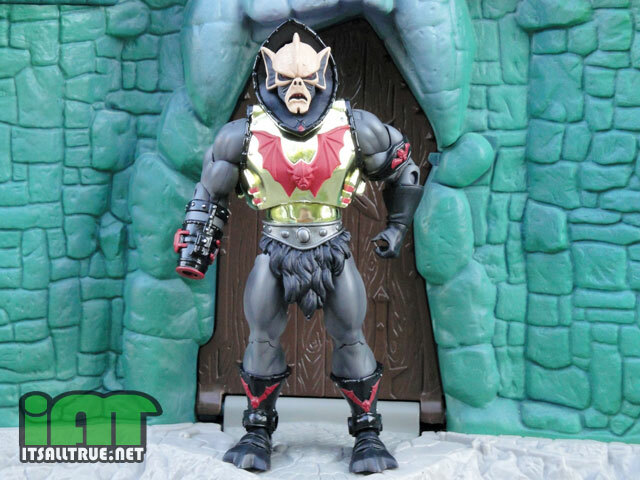 This new Hurricane Hordak is a great modern interpretation of the character, even though there isn’t much new to see when it comes to his sculpt. The majority of his body is reused from the first Hordak release. The most obvious new part is his right forearm and hand, which have been replaced by a mechanical bracer that can hold his new “spinning” weapons. As a kid, I always thought this piece looked more like a canon, and that’s what I used it for the majority of the time. Who needs a hand when you can have a canon? 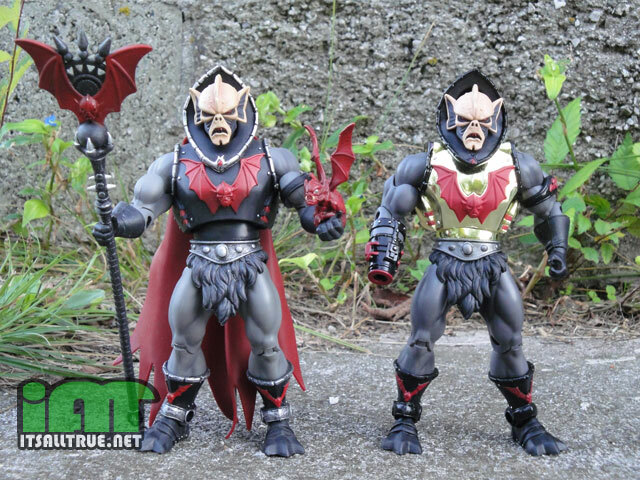 Hordak’s three attachments are Classicized versions of his original weapons. Sadly they’re too tight to spin, but they will fit onto Trap Jaw’s and Roboto’s arms. So hopefully we’ll be seeing some repaints of these weapons in the future. My favorite attachment was always the bat wings. Not only did I use them as a spinning saw blade, but they also made for a great helicopter device that he could use to escape with. The Four Horsemen did a great job mimicking the original’s creepy veins and little claws that grasp the edges. His bola weapon is equally accurate and creepy. I always found it a bit disturbing that the orbs had these spidery veins running across them. Does that mean they’re organic and alive? I wouldn’t doubt it. Especially considering Hordak’s the kind of guy that’s willing to cut off his arm or replace his lungs with spinning saw blades just to have an edge in battle. There is a trick from the model building community that may be of help. This stuff does amazing things not at all planned by the manufacturer. It makes clear parts more clear, it covers and protects better than ‘glosscoat’, it’s amazing. You might take the Hordak armor and dip it in a cup of Future and let it dry, then the plating would be sealed and protected. lay it on paper towel and let the excess drain off. Conversely you could airbrush it on if you have an airbrush. Being a clear acrylic that air cures I don’t think it will react to the plastic or the plating or paint. Again, there’s MANY model builders who use this as a sealing coat over complicated paint schemes and thin, fragile decals. Just to be on the safe side, you might test it on other things first. I might have to try that, thanks for the tip Steve. that tip is incredible, i’ve never heard of this… can’t wait to find an excuse to try it out. Thanks! A 4H Mantisaur is so going to rock. I’m actually not a Hordak fan but you made me see this figure in a new light. Good work! I get what you’re saying . . . but no. My HH only has one eye! how one of his eyes managed to not be painted is beyond me esp considering all his teeth ar painted but I’m sure logistics are to be blamed. cuz the QC is overseen by a syphilitic narcoleptic names Pepi. Maybe your Hordak replaced his eye with a bottle opener. It may sound silly, but you know he’d do it. When I found out his right arm is basically the cannon arm from the cartoon, I couldn’t wait to buy him. He’s going to be me She-Ra display Hordak while I put the original Hordak with my Preternia characters. However, I still think they should make a Battleground Hordak that has blue skin and that same cannon arm. That’s a really good idea. I was originally just going to replace my first Hordak with Hurricane, but now I think I’ll put him on the Preternia shelf too. Thanks Rage! The gold on this guy assailed me with a “glam” perception for a bit, but it’s thankfully dying off. For a moment, I was tempted to turn his maces into disco balls. I’ve taken to flipping his hood upside down. When the head’s mounted on it like normal, it results in a shorter look for the hood and accentuates his cool head sculpt more. Huh, I never thought about turning his hood upside down. I might just do that. 1) Excellent review, with great pics, as per usual. Would’ve been nice if he came with a cape as well, like he had in one of the mini-comics. I’d also forgotten quite how goofily big-headed the vintage Horde figures looked. 2) Please add my name to the Mantisaur petition. Mantises rule. Giant evil cyborg mantises rule even harder. 3) I dunno about anyone else, but I really dislike these “Action Feature Dials” that have been sculpted onto figures that don’t have freaking action features. More pointless than a plucked porcupine. I mean, yes, I do ‘get’ it, the faux action wheel helps give a visual callback and all that, but really? It’s kinda pointless. 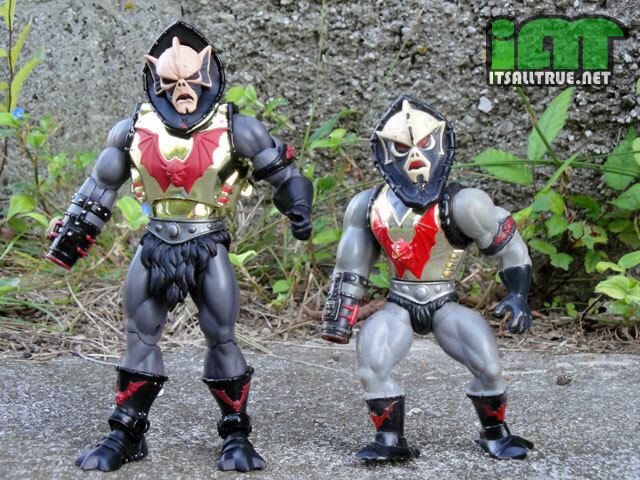 I mean, by that same token why bother giving this Hordak a right elbow? OK, yes, sure, if they went THAT route then they’d have to sculpt an entire new right arm that couldn’t be re-used. But a new thought, going back to the Fisto discussion! Wonder if the Hurricane Hordak weapon forearm could be used as the attachment point for Fisto? I don’t think it would be completely out of place with the giant fist part slid over it. yeah, i know i generally support the horsemen when do some of these cool shoutouts to the original gimmick, but the dial is mega-lame on hordak and only slightly less lame on optikk and psyk. it’s time to collectively ditch the stupid dial. though i recently used them to argue that motuc has in fact embraced the action feature, they just do it a little differently. cuz like on optikk, the dial is there and the eye still rotates… action feature intact as far as i’m concerned. A thought I have been having as I look at the release schedule is that something like Hurricane Hordak “makes sense” to me because of the mini-comics from days gone past. Sure, the cover and the figure that had to be bought to get the comic would give away that Hordak would get a hurricane power somehow, but just those few pages that characterized it made it seem more important. I really don’t use the arm attachments b/c I pretend that his arm is that cannon that he slays turned his right arm into on the old cartoon. His armor is not bad at to me I just dont take it off.Cool review!